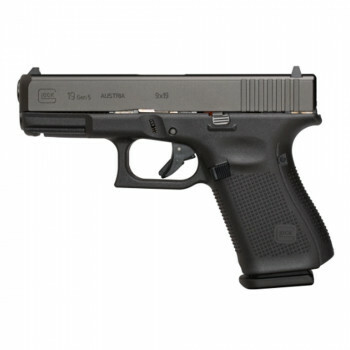 The most popular GLOCK pistol of all time is now available with the numerous improvements that define the Gen 5 pistol line. The versatility of the G19 is further enhanced in its fifth generation while also preserving the dependability it is known for. Gen5 pistols feature over 20 design modifications from their Gen4 predecessors. These changes deliver improved accuracy, durability, performance, control, and flexibility. No finger grooves. Removing the finger grooves improves the ergonomics of the grip, delivering consistent comfort and improved control to a wider range of consumers, regardless of hand size. Flared magazine well. Makes quicker and easier magazine changes possible, particularly in high-stress situations where fractions of a second matter. Ambidextrous slide stop. Now it is easier than ever for both left-handed and right-handed gun owners to quickly, comfortably, and safely manipulate the slide. Glock marxmen barrel. The barrel’s new rifling and crown deliver improved accuracy for both the beginner and the seasoned gun owner. NDLC finish. The ion-bonded finish reduces corrosion and scratching and improves performance in adverse or de-greased conditions.